Ratnabai Sanjay Bhivsane, is the wife of a farmer who committed suicide because he found it difficult to manage the household expenses of a big family. Unable to fulfill the needs of his family, he took debts and was unable to repay them on time, so due to mental stress, on 25/03/16 he took poison & ended his life, putting the burden of all his problems on his wife. 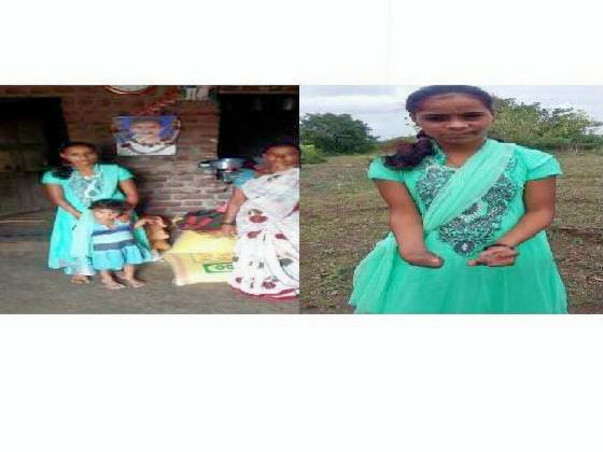 Now Ratnabai has to take care of her 5 daughters including one who is differently -abled. Her eldest daughter, though not having palm, manages to do all the household work, cooks food and even works at the farm. Apart from all these chores she also attends school, and is a very active girl. She is interested in dress designing course so that she can support her mother financially and take care of her younger siblings. She is currently studying in 12th standard, the second daughter is in 9th std, third is in 8th std, forth is in 5th std & the youngest daughter is 4 years old. The household income of Ratnabai is very low as the only source of income is agriculture which comes from her land, the size of which is only 2.5 acres. She thus finds it difficult to sustain and provide financial support to her children. She is living in poverty and misery and has no support from anyone. So, on behalf of Dilasa Janvikas Pratishthan, I am setting up this fund to support her and her children. Livelihood support - financial support will be provided to generate supplementary source of income which does not require much skill and knowledge. Ratnabai's eldest daughter is interested in dress designing, financial support will be given to her, so that she can pursue further studiess and training in that segment. Educational support to the children of the victim - her younger children want to study further but due to lack of financial support they are unable to do so, and might have to discontinue their studies in order to support their family. Financial support for a safer shelter - the family needs a safer shelter, currently they are living in unsafe and miserable conditions. The state of their house is not fit for children, it is badly in need of some repair.